Celebrate Teacher Appreciation Week May 7-11, 2018! 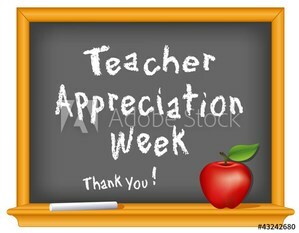 Escalante Parent Organization invites you to celebrate the amazing staff of Escalante through Teacher Appreciation Week. Please sign-up to participate and show your support of the important and exciting things the EMS Staff is doing for our children. We will celebrate the staff all week, but need your help Monday May 7, Wednesday, May 9, and Friday May 11. Please sign-up to help if you can. GO EAGLES!